Here comes the mommy and her little baby! 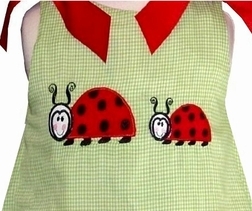 Cute ladybugs just out for an afternoon stroll. 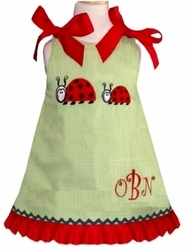 We start with a lime green gingham dress/top and applique the ladybugs on the front. The hem is finished with a red ribbon ruffle and black ric rac on top, and red ribbon bows embellish the shoulders. 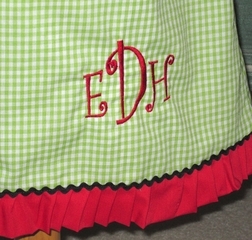 Monogram her initials in red Curlz for added flare!